This month we’re featuring three of our most decorative inserts and grates. Adorned with tiles of all colours and sizes, these inserts are a great way to update an existing fireplace, or add a period touch to your home! Manufactured c.1890 by The Eagle Foundry in Oxford, this rare Aesthetic Movement insert is adorned with original hand-coloured tiles decorated with Cobaea Scandens flowers. 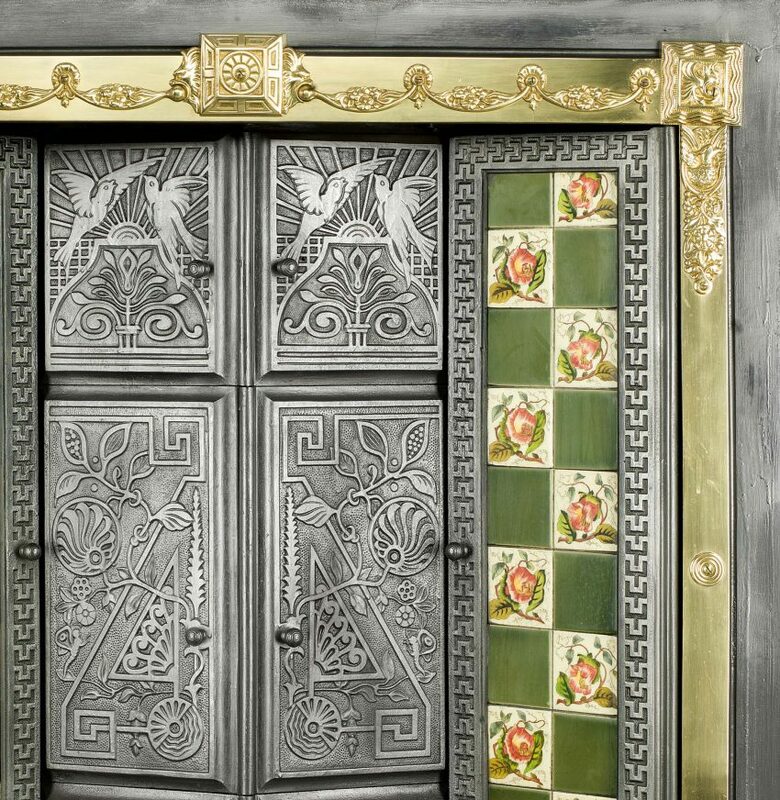 They complement the decorative brass detailing and decorative upper doors, which are cast with stylised birds and flowers. Another rare piece in our collection is an excellent example of 19th century Delftware. These polychrome tiles depict river and coastal scenes of Holland and follow the 17th century Delft tradition of tile design. They were manufactured by J. van Hulst in Harlingen, a company using traditional hand painting and tin glaze to achieve these beautiful tiles. It was the closing of the van Hulst factory in 1933 that signalled the end of the centuries old tile making tradition in Harlingen. Minton, established in 1793 are one of the most famous ceramic manufacturing companies in England. They are particularly well-known for their tiles. This 19th century insert is set with 8 hand-painted tiles depicting medieval domestic scenes. There is an exquisite amount of attention to detail, each interior scene meticilously depicts the furniture and decorations on display whilst the female figures appear to enjoy their sumptuous surroundings. If you would like to see the rest of our decorative inserts then please see here.